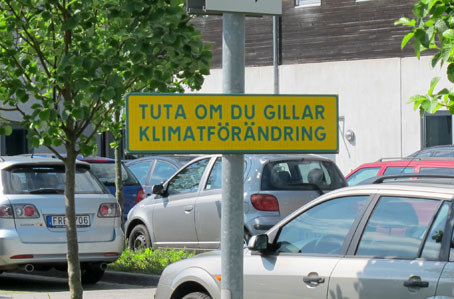 Inspired by Dan Wolgers work with photographs of road signs with the text "HERE ENDS PUBLIC ROAD" from 1995, I made the sign with the text “TUTA OM DU GILLAR KLIMATFÖRÄNDRING”, ("HONK IF YOU LIKE CLIMATE CHANGE"). Two signs are placed at the entrances to the staff parking of the Architecture & Design buildings at Lund University, LTH, where I also teach. I want the sign to encourage reflection, and inspire to discussions about how we have organized our society and how wise it is to uncontrolled burn fossil fuels to transport ourselves + 1500 kg when we solve the need for mobility in an urban environment that we have created ourselves, now that we are heading for 4 degrees of temperature rise according to the World Bank Repport “Turn down the heat”, published in November 2012. The modernist planning-ideals based on theories of among others, Le Corbusier and Walter Gropius, where the street ceased to be a meeting place, large distances between buildings was advocated, zoning with functional separation, motorways only for transportation, “building blocks in a park” as a concept for the location of buildings, paved the way for the kind of urbanisation that is still the norm. Tony Fry, describes in his book "Design as Politics" how we in the developed world have lost the ability to understand the consequences of using the technology that we have created ourselves. The car is perhaps the link in the structure of the globalized society that best represents this dilemma. The car makes it possible to continue to use the modernist urban planning model and build with zoning, separating functions and concentrating trading to the outskirts of cities. The production of goods takes place "elsewhere" organized by the large-scale distribution concepts that creates huge resource flows with unreasonable impact on earth’s systems, destroying local economies and kills the city life in our cities. Should we continue with this? Jag vill med skylten uppmuntra till eftertanke och inspirera till diskussion om hur vi har organiserat vårt samhälle och hur klokt det är att okontrollerat bränna fossila bränslen för att transportera oss själva + 1500 kg när vi löser behovet av mobilitet i en urban miljö som vi själva har skapat, nu när vi är på väg mot 4 graders temperaturhöjning enligt Världsbankens rapport ”Turn down the heat”, publicerad i november 2012. Tony Fry, beskriver i sin bok ”Design as Politics” hur vi i den utvecklade världen har förlorat förmågan att inse konsekvenserna av att använda den teknologi som vi själva har skapat. Bilen är kanske den länken i ett globaliserat samhälsbygge som bäst representerar den låsningen. Bilen gör det möjligt att fortsätta använda sig av den modernistiska samhällsplaneringsmodellen och bygga vidare med funktionsseparering och koncentrera handel till utkanterna av städerna. Produktionen av varor sker ”någon annan stans” organiserad av den storskaliga handeln som skapar enorma resursflöden med orimlig miljökosekvenser, förstör de lokala ekonomierna och tar död på stadslivet i våra städer. Skall vi fortsätta med det här?